Breakfast: Two fried eggs in sauteed kale, two tortillas, 1 tbsp sauerkraut, beans and a cup of tea. This meal mirrors what I normally eat for breakfast, but I had to go with factory farmed chicken eggs (99 cents a dozen) because eggs from chickens who live on pasture and aren’t fed genetically modified grain cost me $5 to $6 a carton. I also had to swap my morning coffee and cream for Aldi tea. It’s actually pretty tasty and I kept some of the concentrated tea at the bottom of the cup to make iced tea later. Lunch: Rice and beans, half an avocado, sambal chili sauce. 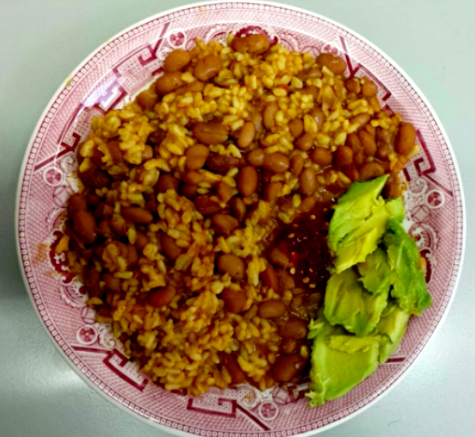 Growing up in a half Puerto Rican family, I was blessed with a love for good rice and beans, and – more importantly – a grandmother who taught me how to cook them. The secret is a good sofrito, which you would ideally make from scratch with garlic, onion, sweet peppers and cilantro. But a great substitute is fresh sofrito sold in area stores like Cermak Produce. Unfortunately we had to go with a jarred version, which didn’t give up much flavor, so I added extra garlic, salt and sambal, which is technically OK for our WBEZ SNAP challenge because they are condiments. Another delicious, money saving trick is buying dried beans, which require overnight soaking but save you tons of money and taste better than canned. The smoky fatty pork hock gives the beans added flavor. Snack: Piece of toast smeared with peanut butter and sliced apple. As much as I wanted a sweet from the vending machines, I turned to the office toaster instead. Now that apples are in season, they are super affordable and paired with the protein-packed peanut butter they recall the peanut-sprinkled taffy apples of my childhood. These tiny bananas delight my kids, but they’re also good for the pocketbook when, in this case, I found very ripe ones discounted at a cost of 99 cents for 18 at Pete’s. I like to eat them on a peanut butter and banana sandwich like a hot dog. Dinner: Raw kale tossed with lentils, rice and a mustard vinaigrette (vinegar, oil, dijon mustard). On a hot September night, this made for a perfect cool dinner. 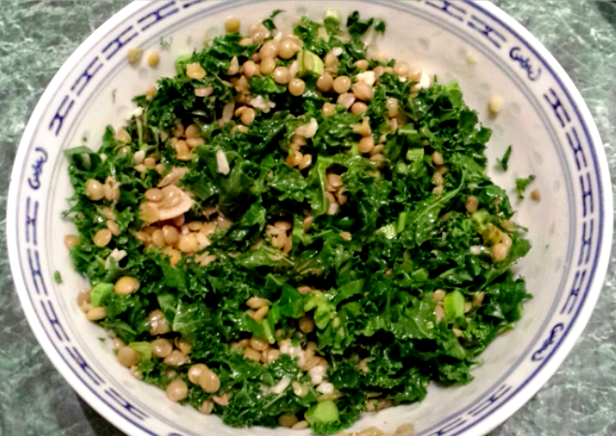 I cooked the lentils in garlicky, salted water until just soft and then tossed them with rice, chopped kale and a mustard vinaigrette (olive oil, vinegar and mustard). My daughter not only took seconds for dinner but asked me to pack more for her school lunch the next day. I wished my budget would have allowed for some chopped red pepper and scallions to brighten up the color and flavor but that wasn’t in the budget. 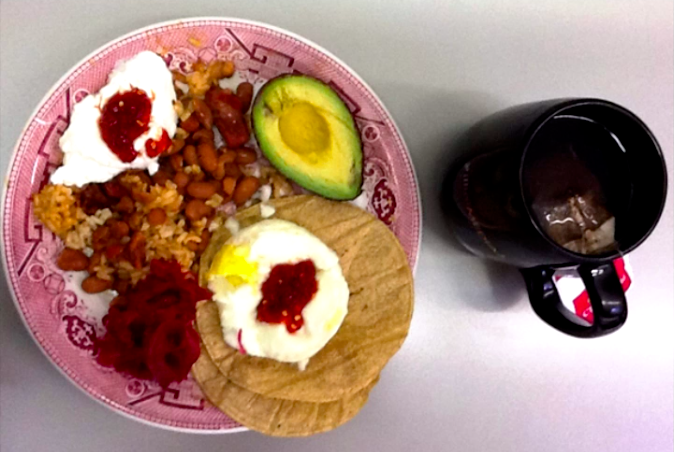 Breakfast: Two eggs poached in a mug, two tortillas, rice and beans, sauerkraut, half avocado and cup of tea. When you’ve got kids to get dressed and off to school, you realize why so many people reach for pricey convenience foods. In our rush to get my daughter to early morning sports practice and a teenager to high school, I had no time to make breakfast. So I gathered all my ingredients and brought them to work. There, I microwave-poached a couple of eggs in a mug, heated tortillas and beans and made a cup of tea. Most people probably don’t have office kitchens as well-equipped as WBEZ’s and so missing breakfast at home might mean unhealthy convenience foods or zippo. 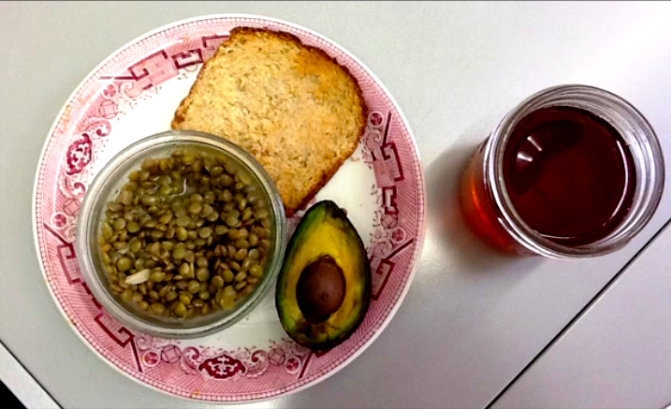 Lunch: Bowl of lentils tossed in mustard vinaigrette, half avocado and piece of toast. I can do lentils for another day but I can see how they might get a little monotonous after a while. The Intelligentsia coffee in the WBEZ kitchen was beckoning me but I’m sticking to my Aldi inexpensive tea that I turned into iced tea for this afternoon. Snack: Nino banana with peanut butter. When I need something small, sweet, a little fatty and nutritious, this is my go to snack. can’t beat the portability of a hardboiled egg. I got these peaches from the “seconds” box at the farmers market for 20 cents each. The pretty peaches cost $5 a quart. After they were ripened, trimmed and sliced the less attractive fruits were delicious. 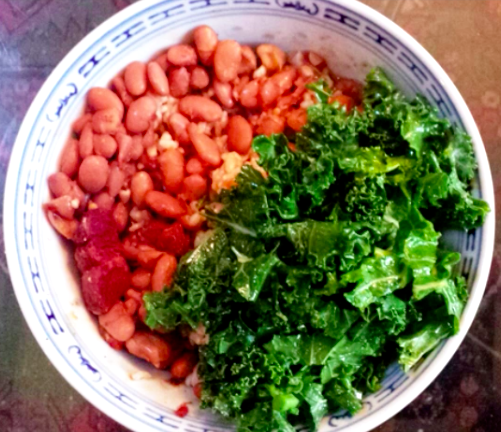 Dinner: Rice and beans with kale salad. If my meals are starting to look a little repetitive, it’s because they are – and that’s how they began to taste. As much as I love rice, beans and kale, I was longing for some of the grilled chicken and watermelon that the rest of my family was feasting on at the dinner table. (15 oz hock cost 9.50 but we split it, then halved the price again to account for the double value given to SNAP benefits at 61st Street Farmers Market.